It’s going to be a quick one today since it’s late, and I have been running behind all day. I guess you can call it a typical Monday! Today I have for you a recipe that was last-minute, yet I had the idea in the back of my mind for about a week. 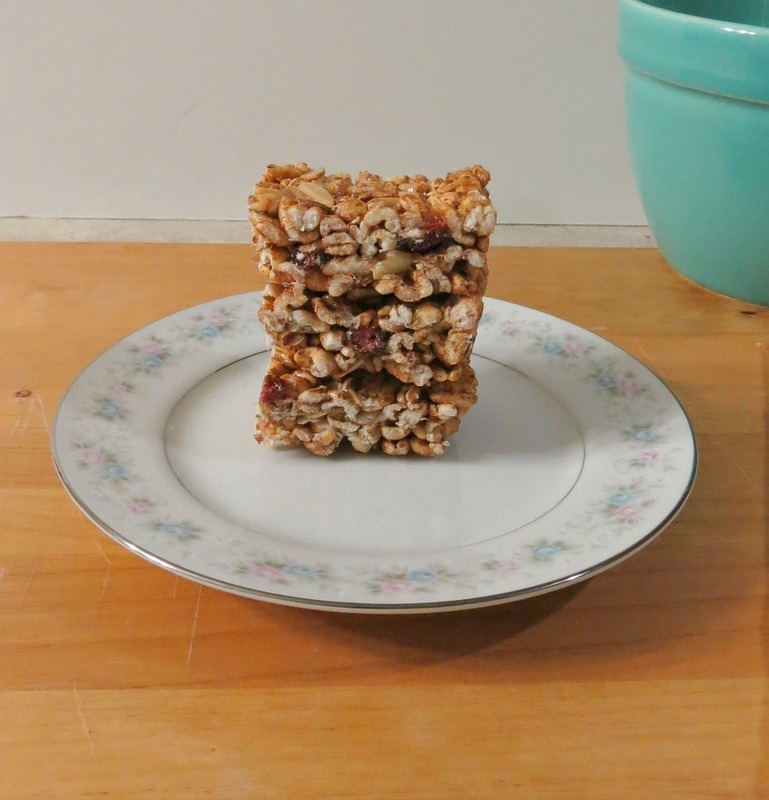 These are my Cranberry and Almond Puffed Wheat Bars. Last week I got my Nature Box and they had Cranberry Almond Bites in them, which is a puffed wheat snack with cranberry and almonds. I LOVED them!!! Then the next thing you know, I was out. But the savvy me decided to keep the bag so I can check the ingredients out. 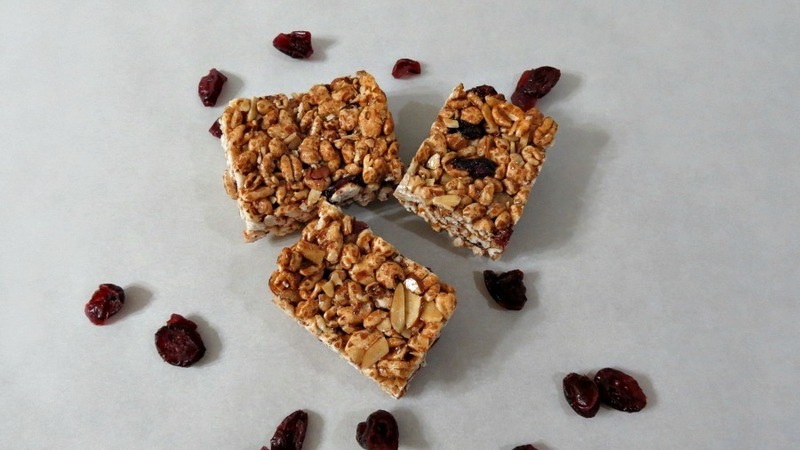 Well, with their ingredients and my pantry goods, I was able to create a puffed whole wheat bar that I think tastes even better!!! 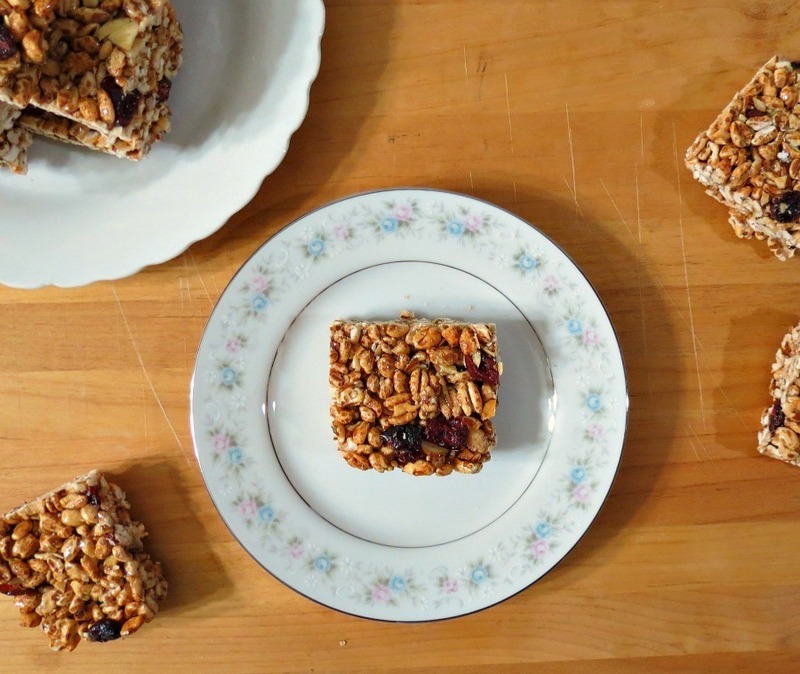 They are made with Trader Joe’s Sweetened Puffed Wheat Cereal, dried cranberries, slivered almonds, brown rice syrup, a pinch of honey and cinnamon. Oh man these babies are good!!! My intention when making these, I was thinking rice crispy treats, but when I mixed it all together, they were pretty sticky, so I decided to bake them, like I would for granola bars. That was the right thing to do. These bars are light, crispy just like a rice cake, but WAY more flavor. I did add a pinch of molasses and the cinnamon, oh the cinnamon really makes these bars stand out. I’m pretty happy with the outcome and was so excited to share them with you! 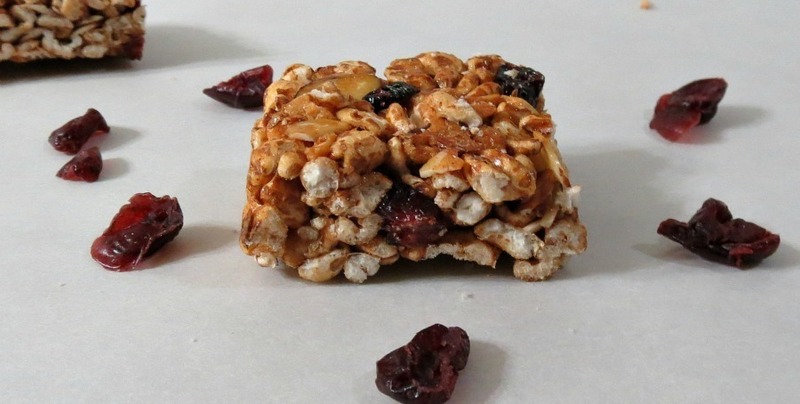 If you’re a fan of rice cakes with a LOT of flavor, than these are the bars for you. I can tell you I will make making them again, but maybe changing it up a bit, maybe a little maple syrup, some mini chocolate chips, oh the possibilities are endless. What is also great is about these bars, are that they make for a nice snack and come in at only 85 calories for a decent size bar. Yah!! 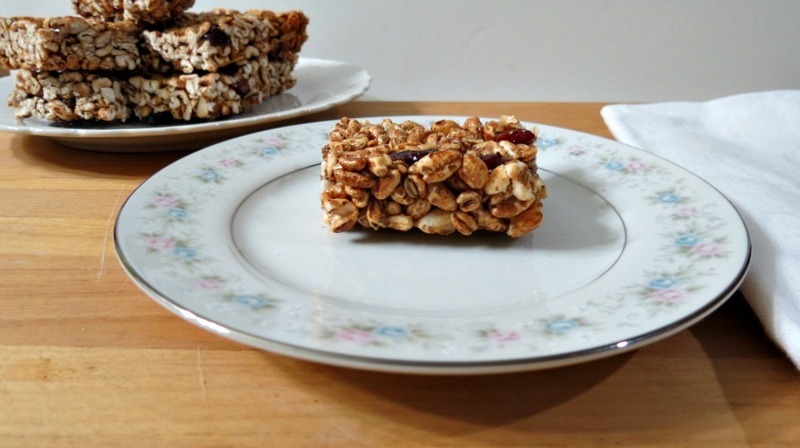 A light puffed wheat snack bar made with almonds, cranberries and cinnamon. Line a 9 x 9" square pan with parchment paper (so ends extend over edges of pan). In a large bowl add puffed wheat cereal, almonds and cranberries; mix until combined. In a small saucepan over low heat, warm the brown rice syrup, honey, vanilla, molasses, salt and sugar, until sugar is melted. Pour the liquid mixture on top of the dry ingredients, mixing well. Make sure everything is coated. Scoop the mixture into prepared baking pan and press down firmly with a back of a spoon (mixture will be sticky). Bake for 20 minutes, or until lightly golden brown. Remove pan from oven, press mixture down again with spoon until the bars are flat. Set bars aside until completely cooled. Once cooled, take the bars out of the pan by grabbing the parchment paper. Remove the parchment paper and place bars onto a cutting board; with a sharp knife, cut into 16 slices. I store mine in a ziplock bags at room temperature. 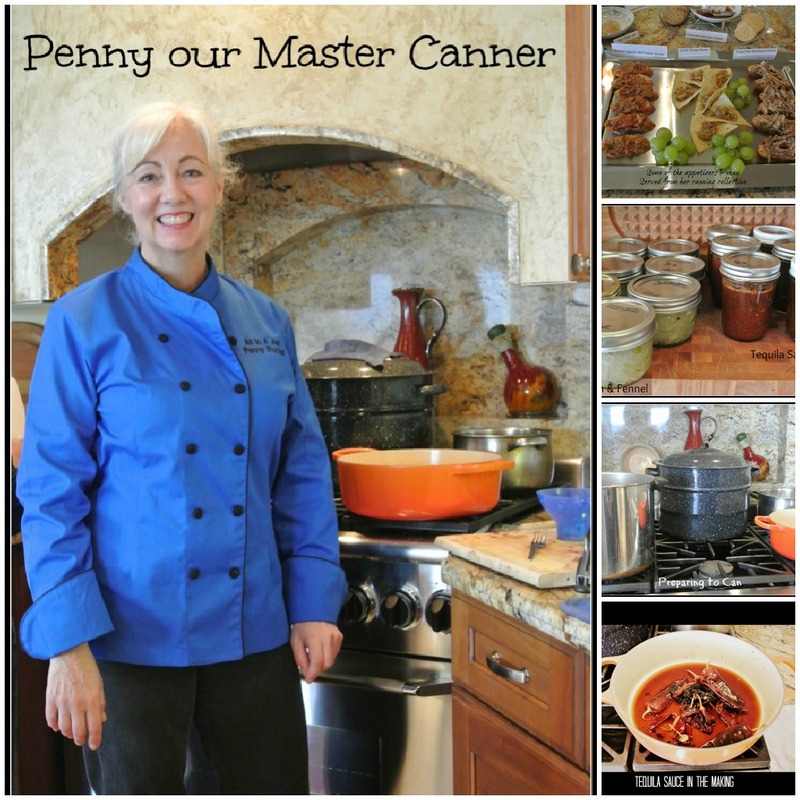 This Saturday Marlene from Nosh My Way and I went to All in a Jar canning class in Lafayette, CA. I had a blast! Our chef Penny was awesome! I never met someone so passionate about their work. She was spunky and so out going, I just loved her!! What’s even better is that she has fun at what she does. She comes up with some crazy cooking concoctions and they turn out great!! She has several classes coming up and I can’t wait to attend them! This weeks class we made Tequila Hot Sauce Caliente and you know that is right up my alley!! Yum!! Plus we made Fennel and Sweet Onion Relish and Seriously Italian Onion and Rosemary Jam! I can not wait to use them, so be prepared for some fun recipes. If your ever in the Bay Area, contact me and we can go together!! I’m telling you, if you’re a canner or not, you will love this class. Plus Penny had some pretty awesome snacks! I filled my belly up and left very happy!! Thanks Penny for a great class! I look forward to attending again!!! I also want to thank Marlene from Nosh My Way for going with me and taking these photos. I forgot my camera and Marlene brought hers! Well my Peeps, I am beat! Time for bed! Have a great day! Wish me luck! Back to the hair dressers to see if she can fix my hair! Ugh! I’m always so impressed when you recreate something just from the ingredient list! These look awesome. The perfect snack foods! Thanks Joanne! I have to do something, especially when it’s hard to come by. Thank you for this recipe. I polished off a bag of the puffed wheat Nature box treats in no time flat (that bag does not contain 4 servings). I was hoping to find a recipe that looked close but you already figured it out. I can’t wait to make these. I am going to Wegman’s tomorrow to get the ingredients. This is fantastic. I’m from back East and boy do I miss Wegmans! Enjoy the Bars! Funny, I just bought some puffed wheat cereal and debating on making a new kind of puffed wheat bars. They make for a great, light snack. 🙂 Enjoy the bars and have fun in Wegmans!! Those bars to look great Jen. Yes, we had a great time canning. I’m in if oyu go again. These bars look yummy! Thanks for posting! I haven’t bought puffed wheat in…forever. I now have a reason to run out and get some, yum! Love that you were going to make them nobake but decided to pop them into the oven and it all worked out beautifully! Thanks Averie! Funny how you have an idea in your mind and then you end up with something different and better! lol, thats the China my Mom gave me! It’s been in our family for about 30 years or more! That sounds about right. I got mine right about 30 years ago. I wonder if your mom got it the same way as I did? It was a special deal at a grocery store (where I happened to be working), you got stamps for every so-many dollars you spent and saved them up on special cards. When the card was filled, you redeemed it for a place setting. It was a really small town & some of the regular customers that didn’t want them would save them up and give them to me. I ended up with service for 12! It was a promotion through the grocers association the store was affiliated with. That’s so funny because I remember the stamps. I think they were green and my Mom had a ton of books. I am not sure where they were for, I want to think Twin Fair, but I”m not sure? I’ll have to ask her. She must have collected a lot of stamps because I have the whole collection, including sugar and cream bowls, plus tea cups and more. Thank you for bringing up a good memory.